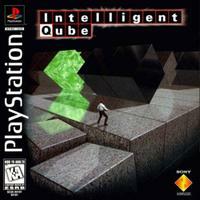 Intelligent Qube puts everyone's I.Q. to the test. In fact, over 800,000 men and women have challenged their abilities in Japan, where Intelligent Qube is selling at the top of the charts. In Intelligent Qube, the goal is to clear the 3D stage in the least number of turns possible without destroying the forbidden black cubes. Easy enough? You'll have to try it to see how challenging it really is. The challenge increases as cubes slam down faster and faster and the number of forbidden black cubes increase. Mess up, and the cubes will either crush you or push you off the edge. And to make matters worse, the game will always remind you just how intelligent you are by calculating and displaying your I.Q. for all the world to see. The better you get at clearing the stages, the higher your I.Q. And with over 20 stages to master, your I.Q. is sure to be tested.